After four straight road games, West Division-leading Commanders host 2-4 Salt Lake team Saturday night. Commanders players with San Antonio ties: Running back Aaron Green (Madison High School / TCU), wide receiver Josh Stewart (College Station / UTSA), Joseph Zema (Melbourne, Australia / Incarnate Word). SAN ANTONIO – Back home after going 3-1 on the road the past four weeks, the Commanders now must do what they couldn’t the last time they played at the Alamodome: Win. 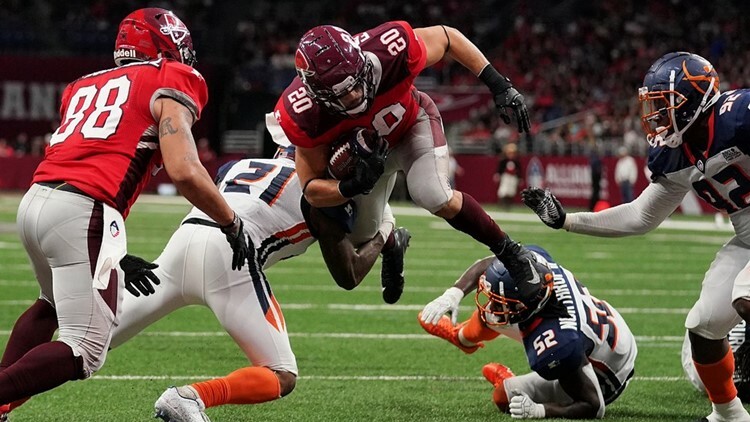 After opening the season with a home victory against San Diego, the Commanders fell to Orlando in Week 2 at the Alamodome after leading by 12 in the third quarter. San Antonio started its run of road games the next week with a loss to San Diego in a rematch of AAF Western Division teams. But then came three straight wins. Now 4-2, the Commanders lead the West race with four games left in the Alliance of American Football’s inaugural season. Only one game ahead second-place San Diego, San Antonio obviously has little margin for error moving forward. The Commanders put their run of three straight victories on the line against the Salt Lake Stallions (2-4) on Saturday night at the Alamodome. Last in the West, the Stallions beat Memphis 22-9 in Salt Lake City to break out of a two-game skid. San Antonio coach Mike Riley cautioned his players not to get hung up on the Stallions’ losing record. Commanders running back Kenneth Farrow II, a University of Houston alum, is the No. 2 rusher in the AAF with 340 yards. Records aside, Riley said there’s little daylight between all eight AAF teams. “These games are all tough,” he said. “Despite the score of the (Commanders’) last game. You never know what to expect, and you have to expect it to be tough. And when you look around the league, all the close games. The Commanders drew 27,857 and 29,176 fans to their first two home games, and a larger crowd is expected for Saturday’s game. Riley has a history with Salt Lake head coach Dennis Erickson. They faced each other six times as college head coaches from 2006-11, when Riley was at Oregon State and Erickson at Idaho (2006) and Arizona State (2007-11). Riley is 4-2 against Erickson. 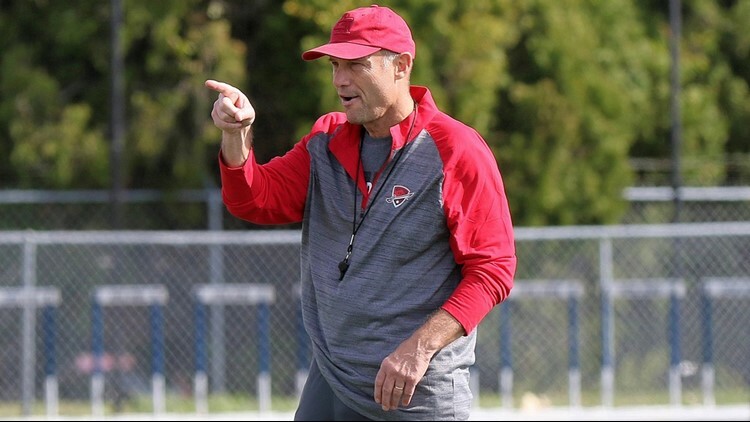 Commanders head coach Mike Riley, 65, has coached in the Canadian Football League, NFL, World League of American Football and college ranks. “I really have a lot of admiration (for Erickson) and I really like Dennis,” Riley said. “We kind of grew up with the same kind of background. Both our dads were coaches. We were both Northwest guys. Led by quarterback Logan Woodside, the Commanders’ offense has come alive in March. The unit’s scoring total in Atlanta last week was a season-high, and Woodside has become increasingly more comfortable in running the offense. Woodside has completed 99 of 173 passes for 1,189 yards with six touchdowns and six interceptions. His passing yardage ranks No. 2 in the league. Running back Kenneth Farrow II has been steady, rushing for 340 yards on 87 carries and four TDs. He also ranks No. 2 in rushing yardage. The San Antonio defense has become one of the most dominant in the AAF, leading the league in sacks (19), takeaways (18) and interceptions (12). Linebacker Jayrone Elliott is No. 2 in sacks (5.5) and cornerback De’Vante Bausby is the interception leader with five. Cornerback Zack Sanchez and safety Derron Smith are tied for second with three picks each. Smith has set a torrid pace the past two games, returning an interception for a 66-yard TD in Arizona two weeks ago and scoring on an 87-yard pick-six in Atlanta last Sunday. 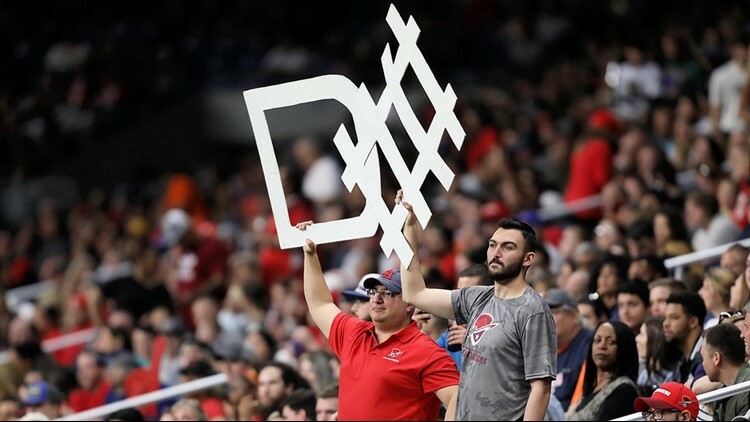 Fans show their support for the Commanders' defense, which leads the AAF in sacks (19), interceptions (12) and takeaways (18). Notable: The Commanders have played four straight road games since Feb. 17, when they lost at home to Orlando in the second week of the season. San Antonio went 3-1 on the road and heads into Saturday night's game having won three in a row . . . The matchup with Salt Lake starts a three-game homestand for the Commanders, who end the regular season at Salt Lake City on Friday, April 12 . . . San Antonio wide receiver/punt returner Greg Ward Jr. was named Alliance of American Football player of the week after setting an Alliance record with a 79-yard punt return in last Sunday's 37-6 rout of Atlanta. The play ranked ninth on ESPN SportsCenter's Top 10 Plays of the Day . . . The Commanders, who lead the AAF in attendance, are expected to draw their largest crowd of the season Saturday. They had 27,857 watch their season opener and 29,176 on hand in Week 2 . . . The Commanders' defense leads the Alliance in sacks (19), takeaways (18) and interceptions (12). The team's secondary, nicknamed "Area 51" has been anchored by cornerbacks De'Vante Bausby and Zack Sanchez and safety Derron Smith. Bausby leads the AAF with four interceptions and Sanchez and Smith are third with three. Smith has returned two picks for 87- and 66-yard touchdowns . . . San Antonio competes in the Western Division with Arizona, Salt Lake and San Diego. Atlanta, Birmingham Memphis and Orlando are in the East Division. Each AAF team plays a 10-game regular season . . . The top two teams in the Eastern and Western conferences will advance to the playoffs, with the championship game scheduled for Saturday, April 27, at the Ford Center at The Star in Frisco. The indoor facility is used as the Dallas Cowboys' practice facility. The AAF title game was originally scheduled to be played in Las Vegas, but was moved to Texas this week.